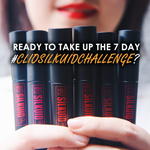 When Coty, the team behind Korean cosmetics brand CLIO, turned to us for the online debut of the new Silkuid Lip Matte, they wanted a launch that would stand out. Typical campaign ideas were out of the question, so we knew we had to think outside the makeup box. With our game face on, we started to proceed with brainstorming. We got all the girls in our team to chip in and share videos and content they liked. What started out as research eventually turned out to be something like a slumber party – as we sat around flipping through magazines, scouring makeup blogs and watching videos of makeup tutorials. Inspired by our two favourite ideas, we finally came up with the #CLIOSilkuidChallenge. We invited women to wear the Silkuid Lip Matte for seven days – just enough time to form a habit. The real challenge of this campaign, however, can be found in these questions: Would we be able to change the minds of women who are intimidated with the idea of wearing lipstick? Could we change the way they feel about it and eventually change their makeup routine? We got our answers by the end of the campaign, and we couldn’t be happier. Finding our first challenger wasn’t easy. We asked a lot of people but it’s actually tough to find someone who’d be enthusiastic about a week-long makeup challenge. Finally, Mel came our way. She was an admitted lipstick newbie who was ready to splash some color in her lips. We helped take some of her pictures and had to follow her around in random places. We’re lucky she’s hilarious so every shoot session day was spent mostly laughing! Over the course of the challenge, Mel became more comfortable with the idea of adding the Silkuid Lip Matte to her routine, thanks to its easy application and long-wear. By the end of the week, she realised that wearing lipstick did make quite a difference to her whole look. Her husband Mark reports that since the end of the challenge, Mel has been wearing lipstick more often! You can see all of Mel’s posts here. After how great Mel’s Silkuid story turned out, we asked CLIO fans to sign up for the challenge. Two lovely ladies, Ashlyn and Beverly, made the cut out of 140 keen challengers. For seven days, Ashlyn and Beverly each took on two shades of CLIO’s Silkuid Lip Matte. Both of them are makeup beginners, but as the days went by, they found that wearing lipstick can be such a breeze. It was very heart-warming to see them excited about the challenge right from the start, and even more so when they completed it. They shared their experiences in detail, with photos of course, for each day. You can see all their posts here. The #ClioSilkuidChallenge gave us the opportunity to explore using native apps on Facebook and see how people engaged with social content through them. For Mel’s updates, we shared blog posts through the Notes function – a first for us. We definitely picked up some know-how while working on it. The current design looks clean and professional, and it enabled us to have a blog series without having to get people to click out of Facebook, so it got more attention. It was definitely interesting to be able to communicate directly with CLIO fans and give them the opportunity to let their voices be heard. Not only did the challengers change their perspectives, they also made CLIO a part of their lives through their routine, even after the challenge. This just goes to show that fans respond well to ideas that affect the everyday experiences of real, ordinary people. You can bet we’ll keep this in mind for our future campaigns.